Resilient and curious, squirrels are commonly found in both rural and urban settings. While some consider them a nuisance, many homeowners enjoy gazing out the window as they scurry around the landscape, darting in and out of the countless hiding spots the typical yard can provide. For these lovers of nature, attracting squirrels to watch is as easy as creating a comfortable environment for them on their property. While most backyards contain numerous pieces of cover for squirrels to explore their surroundings in their naturally skittish fashion, providing plenty of hiding spots will make them feel even safer and more likely to make a quick appearance. Consider planting a number of hedges and shrubs in your yard along with thick patches of ornamental grass to provide added security for these cautious creatures. These design resources can give you landscaping ideas incorporating these squirrel-friendly features. Like any other animal, squirrels are much more likely to return to an area where they can get a safe, reliable meal, and so squirrel enthusiasts can greatly increase their squirrel sightings by providing food sources for their tiny visitors. Scatter corn on the ground near shrubbery and fill bird feeders with nuts of seed to encourage them to come back on a regular basis. Be sure to replace the food as soon as the supply is exhausted, as squirrels will quickly forget a depleted source. A source of fresh, clean water is a welcome sight for a squirrel, who may rarely encounter an ideal drinking source. Place multiple bowls of water near areas squirrels may frequent and watch as they slowly begin to trust it. This is a particularly effective measure for attracting squirrels during the summer months, when cool water is almost impossible to obtain in the wild. Squirrels are most at home in trees, far away from the watchful eyes of ground-based and airborne predators. 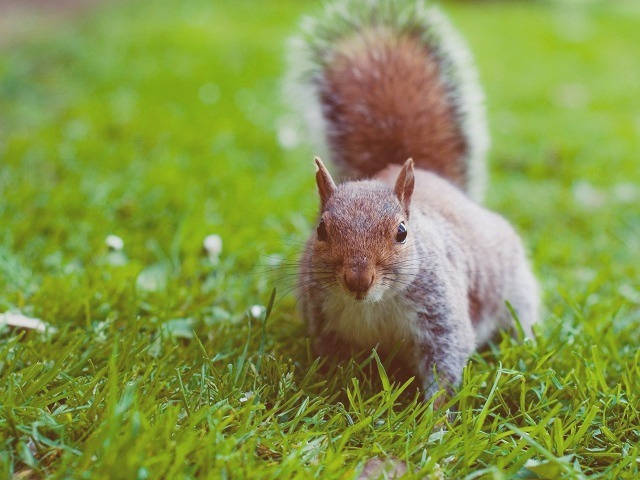 Planting certain kinds of trees is especially beneficial for squirrels, including those with rough bark that permits easy climbing and a branching structure with nooks that supports the nests they call home. An especially squirrel-friendly choice is any tree bearing edible nuts or flowers, which will provide the squirrels with a safe home, a self-replenishing food supply and a consistent supply of fresh water, virtually guaranteeing that they will remain your houseguests for years to come.